A couple months ago, my family and I went to an open house for The Festival of Trees. As we were wrapping up and about to strap our toddler into the stroller, she started having a little tantrum. She still wanted to run around. A nice older lady swiftly came running to our aid…with candy. She said, “Can she have this?” In the moment, I just wanted Sofía to calm down and stop being so difficult, so I accepted her offer. Sofía grabbed the candy and stopped the struggle just.like.that. I was amazed. And sickened. I knew better, but I just went against my own thoughts and beliefs. 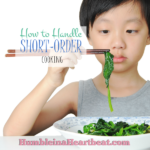 Rule #2 – Avoid emotional eating. 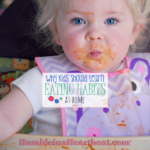 Food is not a pacifier, a distraction, a toy, a bribe, a reward, or a substitute for discipline. By giving Sofía food to shut her up, I am teaching her that when she behaves badly she receives a treat. Um, okay, how does that make sense?! Now for another story that happens day-in and day-out around here. Bella, my 12 month old, will cry excessively when she is just barely hungry. Let me assure you, I feed her 4 times each day, and she can eat! She will literally cry or whine incessantly in between bites. It stresses me out to no end, and pretty much the only way to stop her from crying is to shove more food into her mouth. What am I teaching her by giving her food while she is behaving this way? Only that food is the answer to calm you down. Sofía was the exact same way. Fortunately, she has almost grown out of this stage. This kind of food education only leads to overconsumption and dieting later on in life. Perhaps you yourself are over or underweight because of how you were taught about food growing up. We have to stop this cycle and teach our children how to lead healthy lifestyles with no emotional attachment to food. Let me share some made-up, common examples of using food as an emotional tool. 1. Linda was at the grocery store with her three children, including a toddler. At the end of the shopping trip, her toddler started acting up…in a big way. She stood up in the cart and started to scream. Pretty soon, everyone was staring at her family, soLinda did what most any parent would do in this situation. She whipped out a package of fruit snacks. The toddler immediately stopped her wild behavior and happily ate the fruit snacks. 2. Little Harry is three days into potty training and going strong. He yells at mommy that he needs to use the potty, so she quickly runs to the bathroom with him. He sits down and proceeds to go. When he is done, he gets a lot of praise and love…as well as some M&Ms. 3. Both Emily and Brad are refusing to eat their spinach and broccoli. They ate everything else on their plates, except those veggies. So Dad says to them, “If you eat three bites of your veggies, you can have some ice cream later.” Emily and Brad quickly eat their three bites so they don’t miss out on dessert. Do you see a pattern here? If you are struggling with these kinds of situations, I don’t blame you. It’s not easy to handle kids and their eating. As you can see from my own story, I also have a hard time. You have to have the knowledge, first, that there is a different way. Then, you have to do something about it. 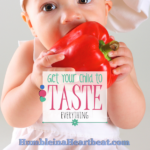 You cannot continue appealing to your child’s emotions when offering food to them. One major way to teach your kids about eating well is to help them understand when they are hungry and when they are full. Starting as infants, children should know when they are hungry. Hunger is a tricky subject. I often feel hungry in between meals, especially if I haven’t eaten for some time. But hunger is not a bad thing. In fact, in the book, Karen LeBillon points out that hunger is essential to enjoying food. 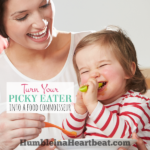 If your kids are constantly snacking, when dinner time comes they are not going to be hungry and will turn up their noses at anything they don’t like. If they are taught when to eat and learn that sometimes you will feel hungry between meals, they will start to enjoy their food more; even foods that they once wouldn’t touch. If you shouldn’t offer food for good behavior, what do you offer? Here are several examples to try. 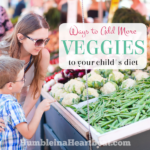 They might not work the first or second time, but as you become more consistent and firm with your decision to change your child’s eating behavior, you will see results. 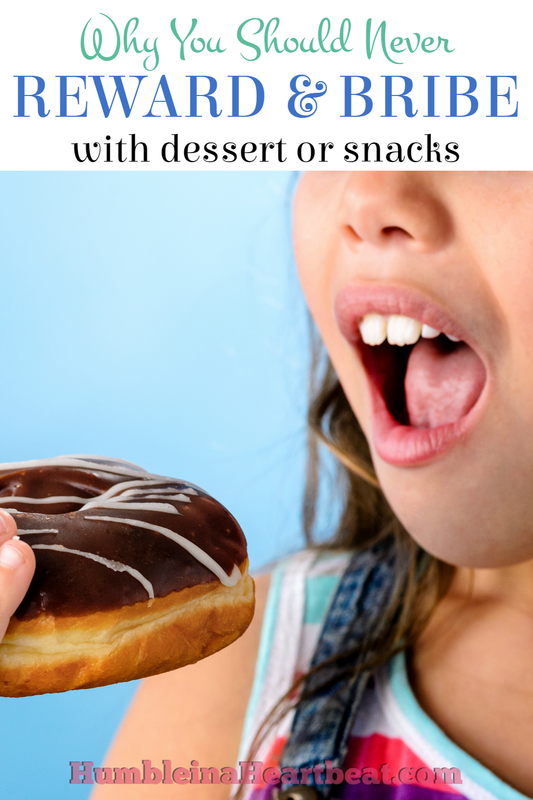 This article is a really quick read if you want even more information on emotional eating. What other non-food bribes can you think of? I’m the briber/rewarder poster mom! A healthy relationship with food is very important and if I find bad or odd habits emerging as a result of snacks I’d definitely make some changes. But for now I can’t imagine a world without goldfish (for him or me)! Hahaha! Ahh, goldfish. They really are highly addicting! I love this post! I’m very sensitive to this topic because I have weight issues due to how food was handled when I was growing up. I am trying to teach my daughter to eat what her body needs and not more and I definitively don’t want to use food as a bribe. It’s so common in this society that it’s hard, especially when you’re out but so far I think we’ve managed well. I just want to raise a kiddo without food issues. Thanks for sharing. This post had great tips. I know a lot of people who are the same way. Bribing is such a huge part of our culture, so I hope as my girls get older I can continue on the path that I have started. I’m really glad that the tips were helpful for you! This is very difficult to read yet I appreciate the insight. 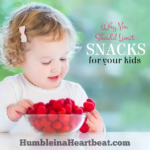 The more I am against this, the more I am reflecting, and seeing things we can also do different to help my children eat healthier heartier meals rather than the snacking much more than I wish to have it. My husband just allowed my son to have a lolly pop to get his hair cut the other day, also my daughter was begging for snacks while I did her hair (just – to eat) and not be bored. This is all annoying and I see their appetites not so good at dinner times. Welp. Thank you for your ideas!